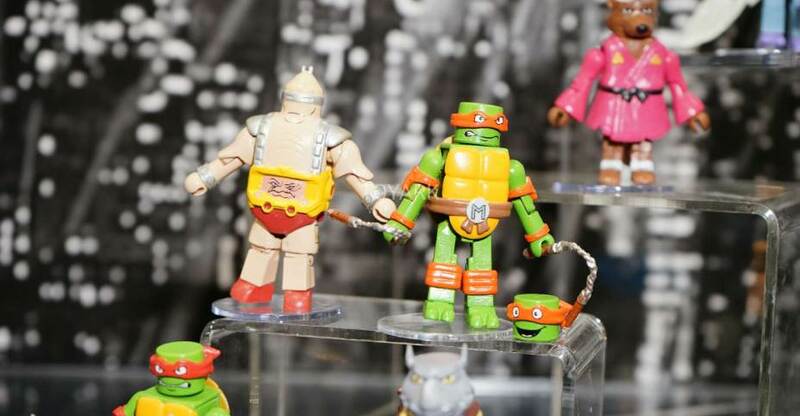 We stopped by the Rise of the TMNT display from Playmates at Toy Fair 2019. Check out the figures, vehicles and more they had on display after the jump. Many of the items on display had previously been seen or announced. Playmates is re-launching the entire brand around the new show and toys. So this event served as the official reveal of the new shipping box branding from Amazon, licensed home items, books, DVD’s, etc. Click the headline of the story for all of the photos. 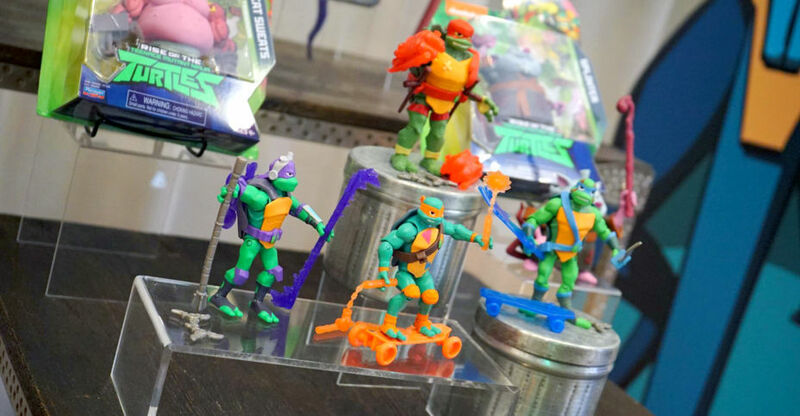 At Toy Fair 2018, Playmates toys debuted their new Rise of the Teenage Mutant Ninja Turtles toys. These includes action figures in multiple scales, vehicles and role play weapons. Read on for the photos. 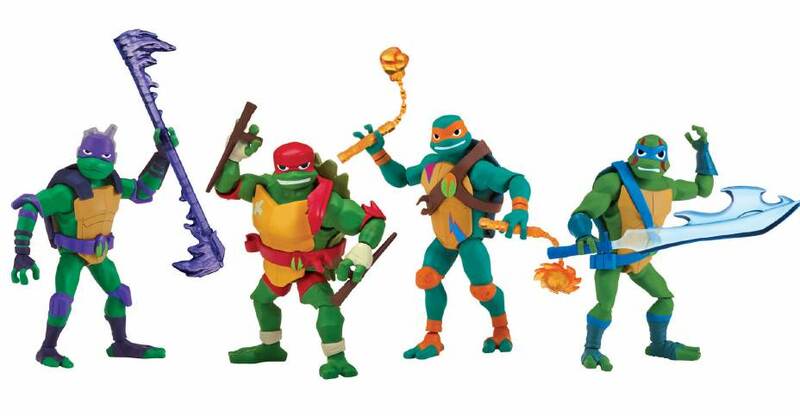 Ahead of Toy Fair 2018, Playmates have revealed new Teenage Mutant Ninja Turtles toys based on the upcoming cartoon reboot of the show featuring an all new look. Included are the core Turtles in multiple size classes, vehicles, playsets and role play. Read on to check out all the details and official product images courtesy of Collider! Here are the remaining Diamond Select Toys collectibles from Toy Fair 2017. These include an assortment of Minimates, Vinimates and Vehicles. Check them out after the jump. Cowabunga! There was a ton of TMNT product from Playmates on hand at Toy Fair 2017. Granted, some of these we’ve seen before, but some of it is also new! You can check out the gallery in its entirety after the break! Playmates Toys has sent out a press release detailing their new line of figures based on Teenage Mutant Ninja Turtles: Out of the Shadows. An assortment of the new figures, playsets and vehicles can be pre-ordered at Walmart.com now. 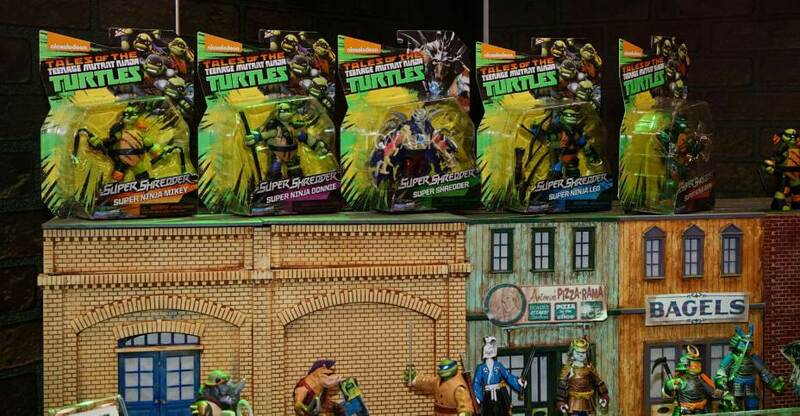 EL SEGUNDO, Calif., April 5, 2016 – Playmates Toys, the company behind the Teenage Mutant Ninja Turtles toy line for decades, is introducing a new collection of products inspired by the upcoming film from Paramount Pictures and Nickelodeon Movies, Teenage Mutant Ninja Turtles: Out of the Shadows. Directed by Dave Green and produced by Michael Bay, the film is a sequel to the 2014 blockbuster film Teenage Mutant Ninja Turtles and will be in theaters June 3. The collection of movie toys from Playmates Toys includes a broad assortment of products for Turtles’ fans of all ages, including action figures, vehicles, playsets, role play gear and movie-themed additions to the company’s existing T-Machines, T-Sprints and Mini Figure collections. The collection of action figures inspired by the film includes Basic Action Figures, 6-inch Battle Sounds Figuresand 11-inch Action Figures. In addition to being highly detailed, fully poseable and uniquely sculpted to capture the personalities and distinctive appearance of the Turtles, allies and villains in the movie, each figure comes equipped with its own unique accessories. The 5-inch Basic Action Figures include the four Ninja TurtlesLeonardo, Raphael, Donatello and Michelangeloas well as Stealth Leonardo, Pirate Michelangelo, Wingsuit Raphael, April O’Neil, Bebop, Rocksteady, Casey Jones, Foot Soldier, Kraang, Splinter and Shredder. Other action figure assortments include the 11-inch Action Figures and the 6-inch Battle Sounds Figures,which feature a button on the figure’s backpack that triggers up to ten sounds and phrases from the movie. 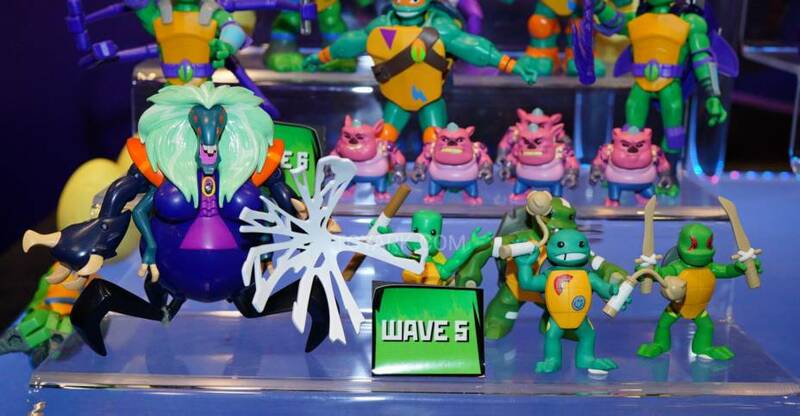 Both assortments include the four Ninja Turtles, as well as Bebop and Rocksteady. Each of the movie-inspired Cycles includes an exclusive action figure and unique ninja action. Cycles that feature ninja-flip action, where the figure will flip over the handlebars into battle position, include the Street Speeder with exclusive Leonardo, and the Ragin’ Racer with exclusive Raphael. Cycles that feature spring-powered missiles include the Warthog Trike with exclusive Bebop, Rhino Chopper with exclusive Rocksteady, and Polaris Slingshot with exclusive Michelangelo. As seen in the movie, the Turtle Tactical Truck is full of awesome foot fighting gear including giant nunchucks that can be deployed as the vehicle rolls, a capture net and ninja stars that can be launched to give the Turtles an edge during battle. The truck also features a working forklift and is designed to hold all four Ninja Turtles. 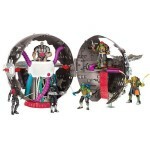 Standing over 40-inches tall, the City Sewer Lair Playset is packed with Turtle action, including an oven-styled pizza disc launcher, water slide entrance that is seen in the movie and more. With over 15 features and multi-levels to play, kids can recreate all of the Turtles’ best battles from the movie in play areas including Splinter’s mediation area and Raphael’s gym. 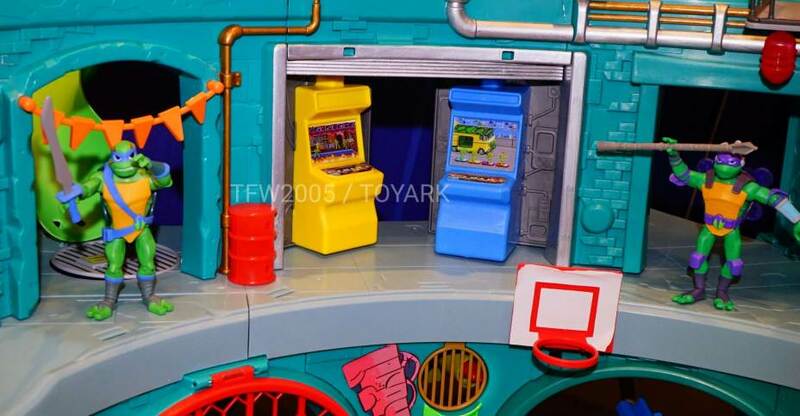 The Technodrome Playset opens to over two-feet wide and is packed with play areas. It includes two missile firing projectile launchers, a secret entrance and trap door slide that drops enemies into a jail. With the new assortment of role play gear, kids can easily mutate into their favorite Turtle from the film. The Conceal & Reveal Weapons offer the ultimate battle surprise, as kids canpush a button to reveal the powerful weapon and then conceal it by pushing it back into the handle. The Extreme Battle Shell is ready to protect kids in any battle and includes a front and back shell for maximum coverage and adjustable straps. To help complete the transformation, Deluxe Masks are also available in a variety of characters. Young heroes can also train to fight like Leo with Leonardo’s Electronic Battle Sword. The sword features two play modes, over 50 phrases and sound effects, and it also glows in three different colors during battle. Kids can add to their T-Machines collection with the new movie-inspired T-Machines Single Pack Vehicles. Perfect for racing through sewers, each 1/50 scale fast-rolling die-cast vehicle features flashy rims and an action-posed, non-removable Turtle character who is driving the vehicle. A variety of movie-inspired T-Sprints Single Pack Figures and Vehicles have been added to the T-Sprints collection. An innovative figure and wheels play pattern, the highly stylized, mini T-Sprints, which reflect the Turtles’ appearances in the movie, feature a unique flywheel so kids can rev them up, drop them into a vehicle shell and watch them sprint into action. The 2.5″ Mini Figures, which will be available this fall, are the perfect collectible for Teenage Mutant Ninja Turtles fans. The blind-bagged, fully articulated figures will be available in an assortment that captures the personalities and distinctive appearance of the Turtles and villains in the movie. We here at Toyark love us some TMNT Minimates! Series 3 dropped a bit ago and we are running catch up today with a gallery of the entire wave, plus another set that we need to catch up on – the First Appearance 4 Pack. Series 3 heads into Season 3’s Vision Quest story with the Turtles done up in their appropriate gear. Splinter gets a clear run celebrating his vision appearance as a chase. The other chase is Ivan Steranko (aka pre-Rocksteady). Rounding out the wave is our first full on mutant offerings in the form of Bebop, Rocksteady and Spike! The First Appearance set features the 4 Turtles in their Mirage Comics looks, they are colored versions of the Black and White set released at SDCC 2015. Head on in for some quick thoughts and over 95 pics! ICYMI: Check our TMNT Series 1 & TMNT Series 2 galleries too! The pics come courtesy of Action Figure Attack, who has even more available. Read on to check out a few mirrored images. Check out the excellent display from The Loyal Subjects during Toy Fair 2016. they debuted their Masters of the Universe Action Vinyls line! They also debuted all new My Little Pony classic style vinyls. As usual, they also had a massive amount of great Teenage Mutant Ninja Turtles Action Vinyls as well. You can see the GI Joe display over at Hisstank. Be sure to check TFW2005 and Tokunation soon for the Transformers and Power Rangers figures.